Clydesdales are huge draft horses that originated from the horse farms of Clydesdale, Scotland. They are one of the most beloved breeds of horses all over the world because they are strong and powerful but still gentle. If you are a horse lover, surely you will want to own this horse breed. However, one of the very first thing you need to consider is the Clydesdale horse price. Are they expensive? How much does it actually cost? The answer is, it vary in price depending on many factors. THIS PRICE IS OKAY TO BUY? The price of this breed is based on different factors such as bloodlines, size, age, color, markings, and level of training. Some Clydesdales have the price ranging from only $1000 to $1200, but most of them sold between $2500 and $5000. If your requirement goes for a normal Clydesdale who has good nature with no conformation defects and is able to ride and drive, your cost could fall between $500 and $1500. In contrast, a beautiful horse with perfect performance and enough necessary traits will bring even more. For example, if you want to buy a horse that is the strongest one in his team, he could cost somewhere from $1000 to $5000. When you’re looking for a Clydesdale horse, besides the initial price, there are other costs that you need consider. The number of food Clydesdales need will be another thing when it comes to the cost of them. Due to their huge body, the amount of food they consume can be as double as that of other horse breeds. Their diet depends on their age and the amount of work they do. On average, an adult Clydesdale eats about 3 to 10 pounds of grain and 25 to 50 pounds of hay every day. The amount of food will be even much more if your horses have to work all day long. So, when raising a Clydesdale, you may have to spend about $150 to $175 per month on feeding on average. You then need to think about the boarding cost. If you own a Clydesdale, you need own barns or stables. The boarding arrangements start from $500 to $2000 per month. Also, the cost of horses shoes and other side foods like horse joint supplement is necessary. 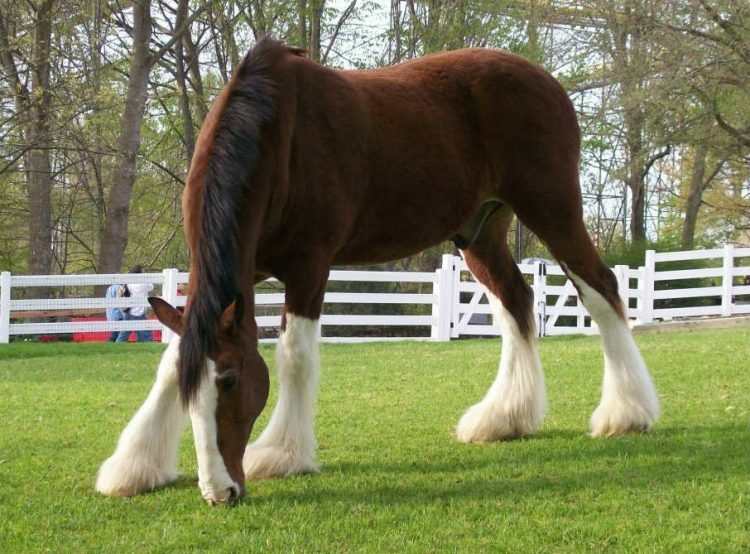 Each set of shoes will cost about $150-$200 for a Clydesdale and should be changed after every 4–8 weeks. You will need a farrier to care for your horse and its hooves. Farrier costs from $25 to $150 per month. Add the cost of annual healthcare to make sure your Clydesdale horses always strong and healthy. Simply saying, the costs for a Clydesdale horse can be much higher in comparison with other horse breeds. So, remember to take time searching for every necessary information about Clydesdale horses price before you buy a Clydesdale.